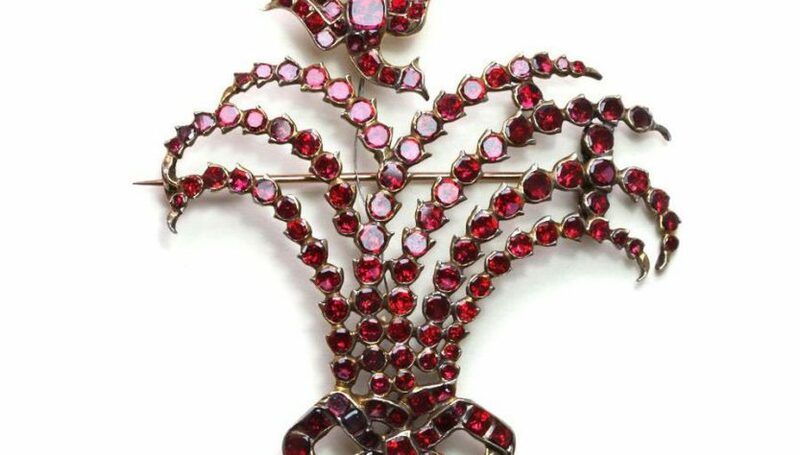 History, sentiment, and spirituality are all linked to garnet, January’s Birthstone. The sometimes fiery red pyrope garnet, deep majestic red almandine garnet, or pinkish rhodalite is one that conjures up many legends and has a long history and storied past. It is a gemstone that is desirable and collectible in early antique jewelry, and due to its many color variations – from deep orange to vibrant green, in addition to the red variations, it has become one of the more popular gemstones among modern jewelry designers. Spiritually January’s birthstone is a stone associated with female empowerment as it is connected to the belief of the Hindu culture that garnets are associated with the first chakra, or the root chakra, at the base of the spine, meaning healthy sexual activity and feelings of security and stability. 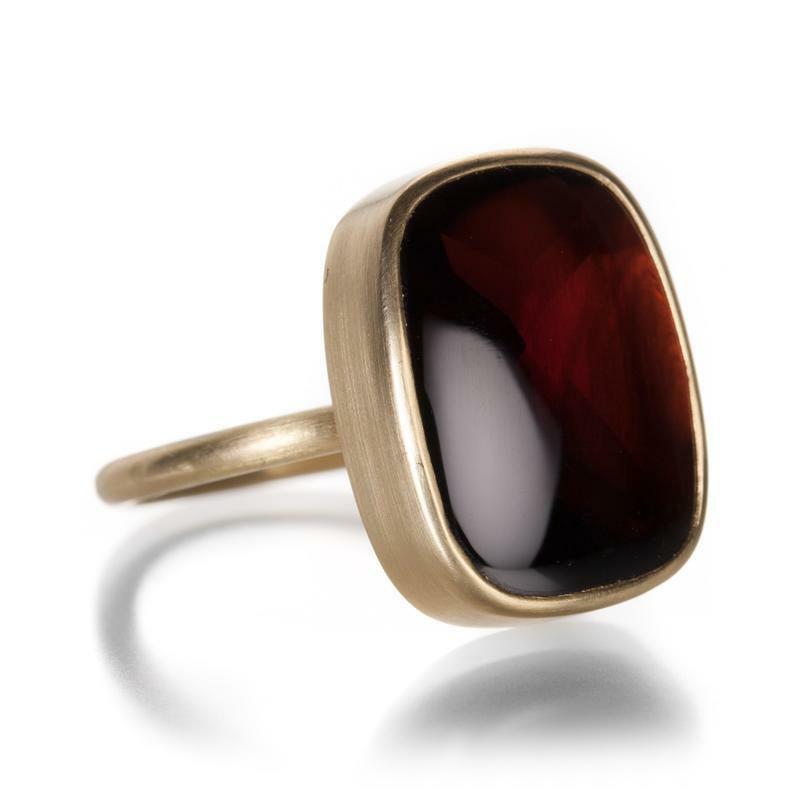 The sentiment of garnet date back for centuries, a few of the meanings evoke friendship, devotion, and compassion, which are the type of emotional connections that are perfect for women born in January or those who want to wear pieces that are associated with these positive connotations. 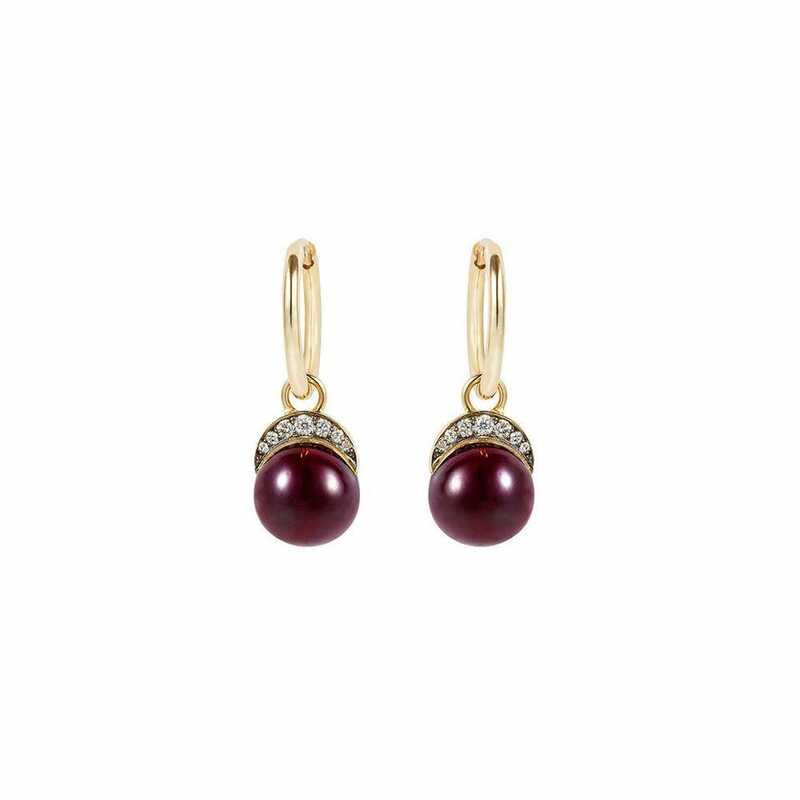 Looking back on the legend of garnets, the name is derived from the Latin word granatum meaning pomegranate. 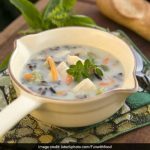 They were thought to reflect the vibrant seeds of the fruit. In ancient Egypt, red garnet necklaces were worn by pharaohs and were entombed with their mummified bodies as prized possessions for the afterlife. In Rome, garnets were widely traded gemstones and carved garnet signet rings were used to stamp the wax that sealed the contracts on important documents. 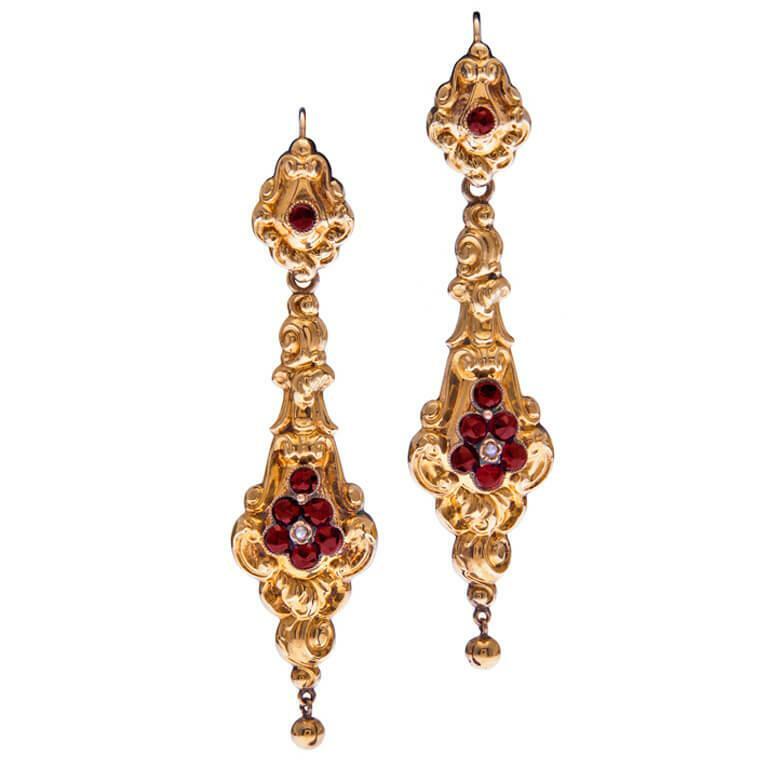 In the Middle Ages, from about 475 to 1450 AD, red garnets were favored by nobility and the clergy. And garnets have long been thought of as a traveler’s stone – Noah’s Ark is said to have had a garnet lantern to help navigate during the night. 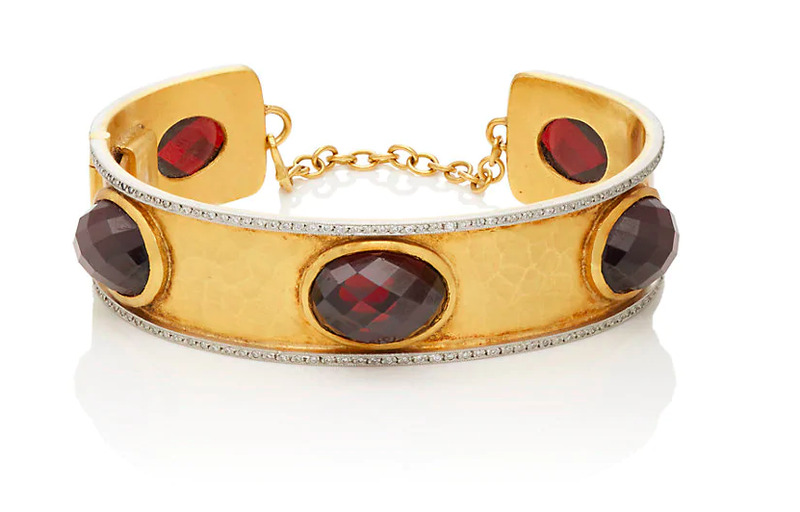 Historically, large deposits of red garnet were discovered in Bohemia in Central Europe around the 16th century, which would cause this gem to become a popular stone for jewelry during became the 18th and 19th centuries. Bohemian garnet from the Czech Republic continues to be mined today. In the Georgian period, garnets were the jewels du jour. 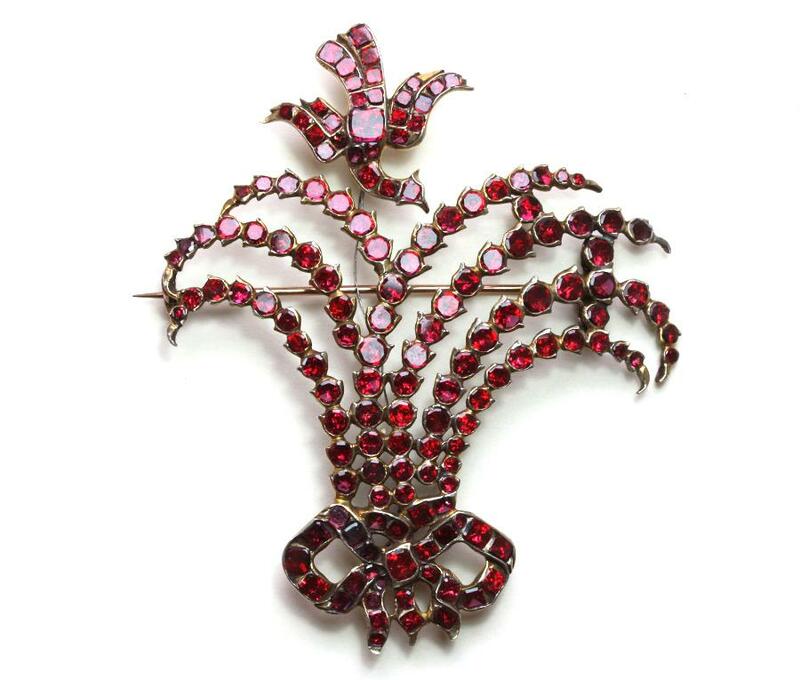 The popularity of garnets during these times was threefold: they were affordable, complemented almost every complexion and the almandine color had a regal feeling in flat cuts and cut down collet closed back settings. The favored styles were aigrettes, parures of foliate and naturalistic motifs with necklaces that split into two bracelets, removable pendants, hair ornaments, and day to night earrings, which offered almost an entire jewelry wardrobe. Motifs such as Maltese Crosses, pansies, witches’ hearts, and portrait and memorial lockets with flat-cut round garnet surrounds were the most popular of the day, first set into silver in the early 1700s and then later into gold. 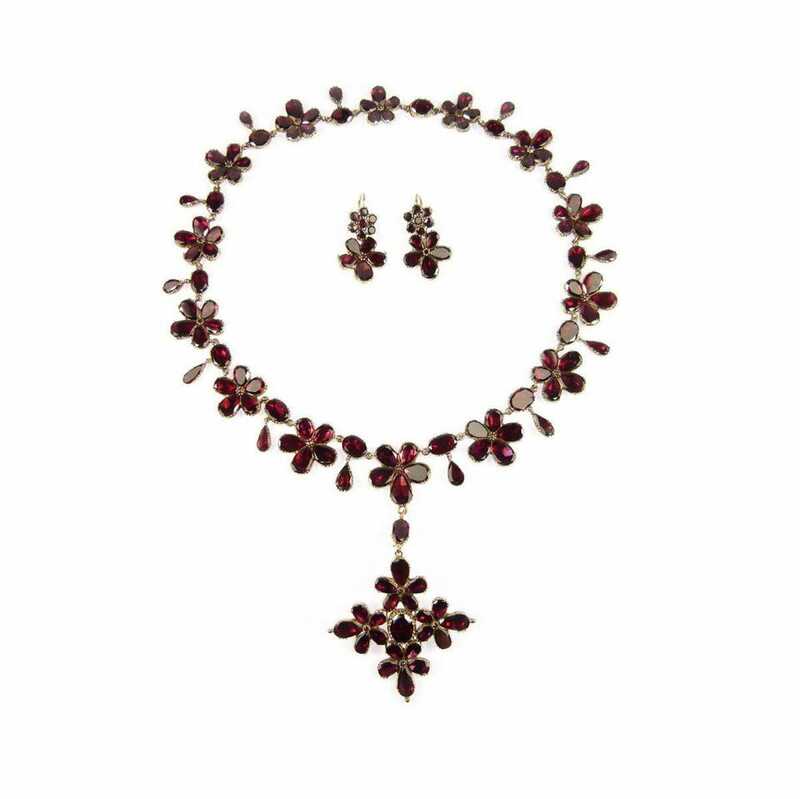 Although garnets fell out of popularity around 1820, they witnessed a revival during Victorian times after the industrial revolution. Many garnets of the era were rose cut, which were set into low carat gold. There was also a trend towards the traditional handcrafted Bohemian design, which was designed in gilt metal and showed great beauty in a cluster-type arrangement such as the sun and the moon, horseshoes, and floral motifs. These tended to show more stone than metal. The brilliant sparkle of Bohemian garnets is due to their transparency and high refraction of light. 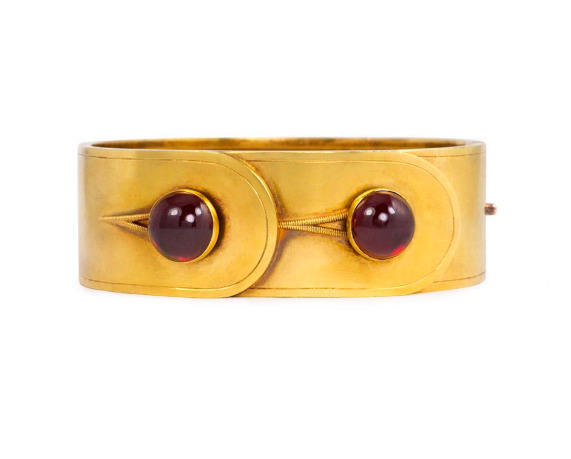 They were also cut cabochon style or customized to fit the design of various late 19th Century bracelets. 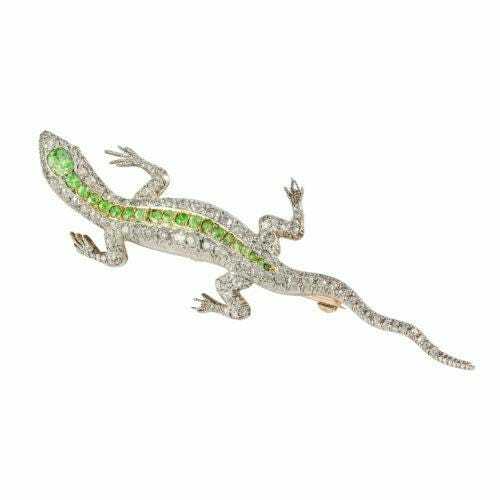 Antique jewelry during the 19th century was also set with the glorious green garnet called demantoid. It was found in Russia’s Ural mountains and due to the material being scarce, it was usually cut into small stones that accented the naturalistic designs of the times from lizards and snakes to floral motifs. Today it is even more rare. Tsavorite is the vibrant green garnet that is also rare and commands a high price tag. It was first mined in East Africa. Fine tsavorite is rarely over four carats and for most contemporary designers, it is a stone that is incorporated into a design in smaller sizes. In modern design, garnet’s painterly palette has lent some competition to colored sapphires. 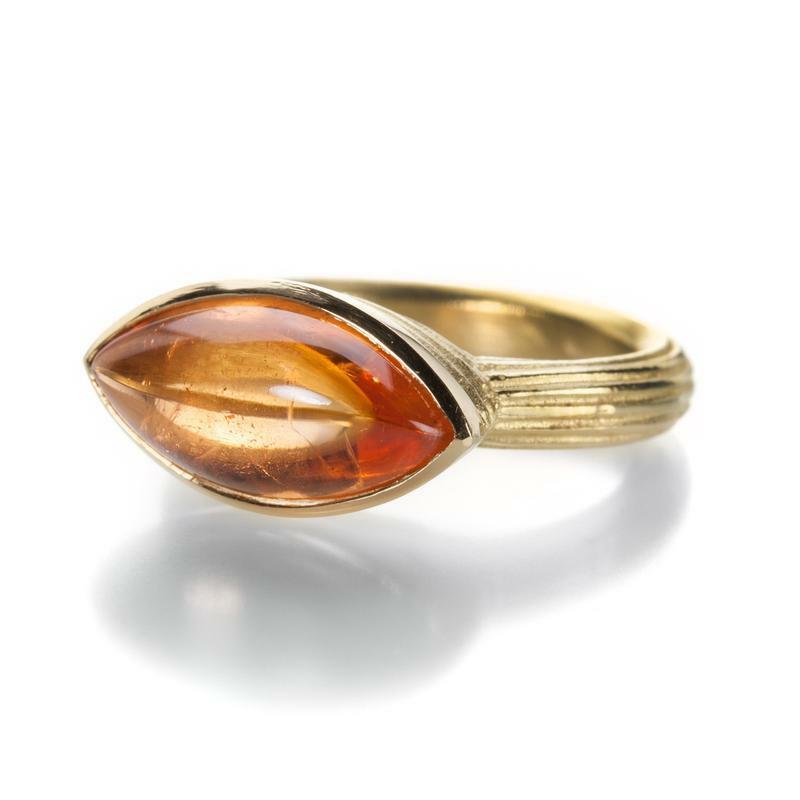 It runs the gamut from purplish/pink rhodalite garnets or deeper mysterious almandine as well as all of the myriad colors of this stone including hessonite which is a deep golden yellow, mandarin which leans more to Sunkist orange and Spessartite which is a vivid more exotic shade of orange. And, recently violet garnets landed on the scene which are radiant, vivid and intriguing. But you are devoted to red as your garnet color of choice, then January’s birthstone just might add some fire to your life. Oh, and some special pieces of antique and/or modern jewelry. Will The Jewelry Trends Change From 2018’s Golden Globes?